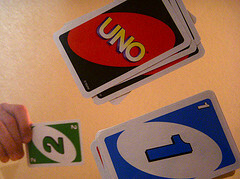 Uno, Spanish for “one”, is a card game that was invented in 1971 by Merle Robbins of Ohio. When arguing with his son about the rules of Crazy Eights, Merle concluded to develop his own game as a settlement to that argument. Uno was created and the first decks were constructed right on their own dining table. Uno is a shedding game and is pretty similar to Crazy Eights. It can be played with up to 10 players and the object of the game is to be the first to get rid of all your cards. There are 108 cards total. This includes 25 yellow cards, 25 red cards, 25 greed cards, 25 blue cards, and 8 black “wild” cards. For each color there are number cards (0,1,2,3,4,5,6,7,8,9) and action cards (skip, draw 2, and reverse). Wild: this card can be played after any card no matter the color, and switches the play to any color the player (that lays it down) names. You must name a color when laying it down. There are no restrictions for when you can play a wild card, as long as it is your turn. Wild Draw 4: just like a regular wild card except the next player must draw 4 cards and lose his/her turn. You must name a color when laying down a wild draw 4 card. The restriction for this card is that you can only play it if you don’t have any cards in your hand that match the color of play. So if the person before you played a yellow 7, you could only play your wild draw 4 card if there were no yellows in your hand. To decide the dealer, each player picks a card out of the deck. The player with the highest number card becomes the dealer for the game. Reshuffle the deck and then deal each player 7 cards. Place the deck in the center of the table and flip the top card over so it is faced-up next to the deck. This is to start the discard pile. If a “wild draw 4” card is flipped, return it to the middle of the deck and flip over the next card. The player that is to the left of the dealer begins the game (clockwise) unless the “Reverse” card is the first of the discards, in which case play would start to the right (counter-clockwise). For each turn, you must have a card that is either the same color or same number (rank) as the top discard (top faced-up card in the middle of the table). Or you could play a wild. Lay your card on top of the discard pile, and the player following you will have to play off that. If you can’t play, or chose not to, you must draw a card from the draw pile. If that drawn card is playable, you may lay it down right then. Either way, play then continues to the next person. If all the draw cards get drawn, flip over and shuffle the discard pile leaving only the top discard. Now you have a new draw pile to draw from. When you get down to having only 1 card in your hand, you must say “uno” to warn the other players. If someone calls out your uno before you do, you lose your turn and draw 2 cards. The first player to get rid of all his/her cards wins that hand. Once this happens, the remaining cards that are in the rest of the players’ hands are given to the winner and counted for points. Wild cards are worth 50 points, colored action cards are worth 20 points, and numbered cards are worth their displayed number. Most games are played to 500 points, but this should be decided on before that game starts. If you play a wild draw 4 card even though you have a playable colored card, you must draw 4 cards. Keep others accountable. If you are not first to say “uno” when you are down to 1 card, you must draw 2 cards. If suggestions are given to other players of which card to play, the player that made those suggestions must draw 2 cards. If a player discards a card that doesn’t match the rules, he/she must remove that card and also draw 2 additional cards.